Abstract: In The Courage to Collaborate, school turnaround expert Ken Futernick makes the case that collaboration between school management and teacher unions is a necessary condition for educational improvement. The author cites evidence showing that collaboration often leads to increased trust, stronger professional relationships, better policies, better implementation of programs and, ultimately, to better outcomes for students. Drawing on new research, his own experience, and the experience of dozens of other district and union leaders, Futernick details key features and benefits of labor-management collaboration. He also identifies and addresses several obstacles preventing its widespread adoption, including resistance to change, myths about what collaboration really means, skepticism about unions, lack of technical support, and misguided education policy. 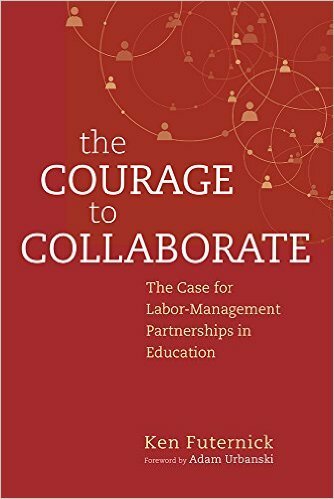 The Courage to Collaborate recommends strategies and tactics for educators, policy makers, and others interested in embracing collaboration over confrontation. Both sides—unions and management—must make changes so that collaboration becomes the norm, rather than the exception, Futernick argues.